I think January is one of the coldest months of the year. Here in NE Texas we don’t really get cold in November. And the first part of December it’s not unusual to be wearing shorts. By the end of December we get what we consider cold weather, but oh January! Now I don’t know about you, but when those cold winds blow I like to be inside with a warm fire going, a nice warm lap blanket and schnoodled up on the couch watching movies. RancherMan & I enjoy a hot steaming cup of hot cocoa too. Now the powdered stuff tastes good enough I guess, but it’s no comparison to the homemade version. And it’s quick & easy too. Just make a chocolate syrup using cocoa, sugar & cold coffee, add the milk and voila! 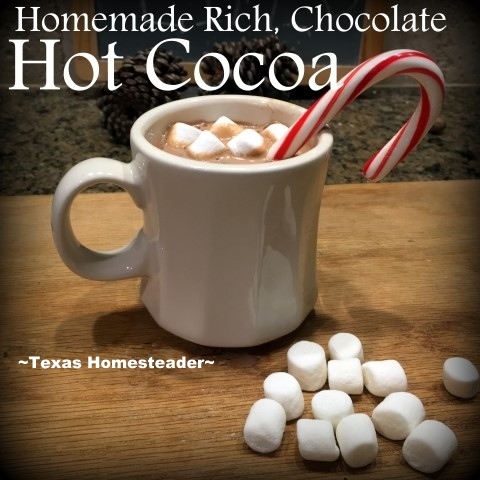 This entry was posted in Blog Posts and tagged Throwback Thursday on January 12, 2018 by Texas Homesteader.